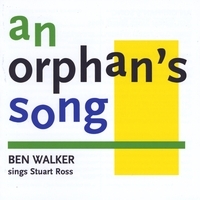 15 adaptations of Stuart Ross poems (12 with keyboard, 2 with guitar, 1 with mandolin) composed and performed entirely by Ben Walker, beautifully recorded by Richard Ashrowan. Humour, tragedy and surrealism in Stuart's words, catchiness, grooviness and silliness in Ben's music. Successfully launched at The Savannah Rooms, Toronto on March 9th 2008.